Magic Flame comes out on Tuesday! Have you pre-ordered your copy? 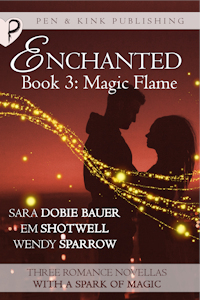 With three stories by three wonderful authors, the Enchanted series is sure to capture you heart and imagination. 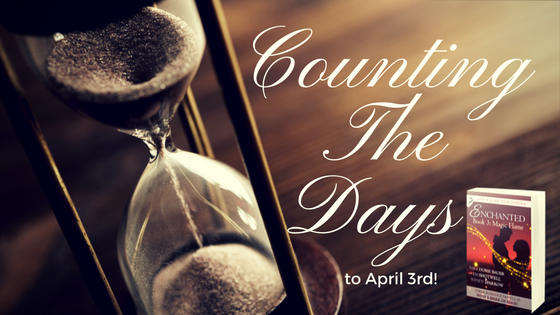 To end off our countdown series, we get to know more about the authors. 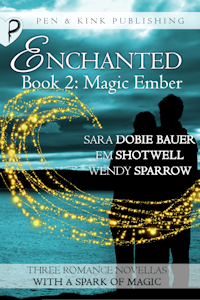 How challenging was it to weave together three stories for the Enchanted series? I’ve done series stories before and once I get into a world, I like playing around in it. If anything, it’s more difficult for me not to create backstories for everyone involved in a story. In fact, my Servants of Fate trilogy was created due to that. I couldn’t leave the world alone. I still can’t. I loved the idea of writing three inter-weaving stories for this series and was pretty much gung-ho from the beginning. The first version of my first-in-series novella, THESE ROOTS RUN DEEP, was actually told from each of the Murphey sisters’ alternating points of view. In the end, we decided that since we were limited by word count, it would be best to devote an entire novella to each sister. Of course THESE ROOTS RUN DEEP is Cheyanne’s story and is told from her point of view, but writing that first draft gave me some really great insight into how Marchland and Bradley truly viewed Cheyanne. It really helped me to know my characters better, and since I felt I knew them so well, it was easier for me to dive right in and tell their stories, too. I really love these characters of mine and hope to maybe one day give them their own full length novel. Well, I cheated. My stories are three separate parts of a bigger story called “Destiny’s Dark Light.” See, CHEATER. But I couldn’t help it. I fell so in love with Cyan and Liam that I wanted to spend more time with them. I also didn’t mind hanging out in Charleston, South Carolina, for three stories. How did you come up with your idea for the trilogy? I wish I knew. Most of my stories start with either a muse or a song. As fans know, I’m a Benedict Cumberbatch psycho, so he might have inspired Liam a little bit. I also listen to sort of sad, dark, Southern music—think bluegrass with a goth twist. (Gosh, that sounded weird.) Stuff like Ray Lamontagne, Hozier, and The Civil Wars. Certain scenes in “Destiny’s Dark Light” have a definite soundtrack. All that said, I do love witches, so building a witchy world in the super-haunted coastal town of Charleston was oodles of spooky fun. I sat around brainstorming on magic sources, waiting for something to strike me as original and fun. I like to challenge myself with unusual scenarios or characters that really stretch my writing. I seem to remember that the woman being the demigoddess of death and the man being the demigod over fertility for the first book made me smirk the whole time I was writing it. In other novels or novellas, I’ve focused on characters with disabilities or a past that impedes their romance—at least in their minds. I just really like working with humans who are as flawed as most of us. Imperfect people with their imperfect romances are more interesting. I had already been toying with the idea of THESE ROOTS RUN DEEP for a while and was planning on subbing a much leaner version to magazines. When Cori tapped me to participate in this anthology and explained the concept, I knew exactly what I wanted to do. I wanted to show that twisted side of “love.” The side that borders on obsession. The side that isn’t really love at all, but is the result of what happens when we begin to think only of ourselves—it is what happens when selfishness enters a relationship and begins to twist and warp things until it no longer resembles love at all—but yet—somehow people can still fool themselves into thinking that is exactly what it is. 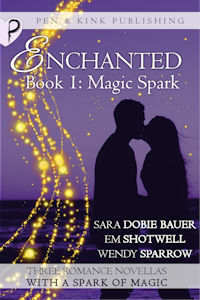 Cheyanne “loves” Brett and will do anything to keep him…anything. I love “unlikable female characters” (though I deplore that term) and I knew that Cheyanne wouldn’t come away smelling too good, but hey, if you ask me, if you are in a relationship with a witch, then you should be smart enough to at the very least stay true. So the second that I “heard” Cheyanne say “stay together forever to put down some roots,” I knew exactly what was going to happen. Poor Brett. When you start to feel the story you’re writing stall, what helps keep you on track or give you inspiration? Tumblr. I’m not even kidding. I browse Tumblr and look for creative inspiration. I also listen to music. Pandora is great because you never know what you’re going to get. You never know when a song might touch you just so. Sometimes, I step away from a project for a couple days. If a story stalls, it’s time to sleep on it. I often work out plot problems at 3 AM. Not necessarily good for sleep but great for creativity. Honestly, if I have time, then I take a break and read or work on something else. I always give myself a timeline for this, though. Say, I will take a week off and then get back to it. If I am on a time crunch then I power through. Usually when I go this route, the end result is less than stellar…waaaaay less than stellar. However, it gives me good bones to play with. I can then look at what I’ve written and fix it. If you just quit—then there is nothing to fix. Another piece of advice I have received that I find helpful is to just make your characters do something so different than what you’ve had planned, that the story takes a drastic turn. This is what happened when I introduced Agatha-Rosemary from Oxford, Mississippi. She is an octogenarian elder-witch whose bad side you definitely do not want to be on. The story had new life once this character came on board. She was really fun to write. You know, I don’t have this problem during the initial writing of a story. If anything, I can’t stop writing. I have clinical OCD and writing becomes obsessive so I’ll writing for fourteen-hour stretches because I’m obsessed with the idea that I’ll forget something. During the revision process, I can become stalled on how to fix something, especially if I’ve been watching a lot of TV. It feels like my brain is fogged up with too many voices or stories. If I go into a sort of seclusion and don’t watch any TV for a couple days, it clears up for me. My family doesn’t like that. I usually come out of my media blackout and they insist on watching a lot of movies to make up for the famine of entertainment. I used to take my dog running to get inspiration because physically activity would help, but my health has been sketchy. I really miss running actually.